1. What are the main representatives species of pteridophytes? Is this plant group cryptogamic or phanerogamic? The better known pteridophytes are ferns and maidenhair, from the filicinae (filicopsida) group, and selaginellas, moss-like plants from the lycopodinae group (lycopsida). Pteridophytes are cryptogamic plants, meaning that they are flowerless and seedless. 2. How different are pteridophytes from bryophytes regarding substance transport? Pteridophytes are tracheophyte (vascular) plants, meaning that they have tissues specialized in the conduction of water and nutrients. Bryophytes are nonvascular plants. Therefore, in pteridophytes, the substance transport is carried out through vessels whereas, in bryophytes, that transport occurs via diffusion. 3. Why are pteridophytes better adapted to dry land than bryophytes? Were pteridophytes always less abundant than phanerogamic plants? Although bryophytes and pteridophytes have gametes tha depend on water for fertilization, the emergence of conducting vessels in this last group facilitated life in a terrestrial environment. The conducting vessels of pteridophytes collect water from moist soil and distribute it to the cells. Bryophytes do not have this option and depend entirely on the water that reaches the aerial part of the plant and, as a result, they need to live in humid or rainy places. Before the evolutionary development of phanerogamic plants (plants that have seeds), pteridophytes predominated in the terrestrial environment. The large pteridophyte forests of the Carboniferous period (named after the pteridophytes) are responsible for the formation of coal deposits, mainly in Europe, Asia and North America. The Carboniferous period occurred between 290 and 360 million years ago and was part of the Paleozoic Era. 4. What is the evolutionary importance of pteridophytes? As the first tracheophytes, pteridophytes were also the first plants to extensively colonize the terrestrial environment, forming forests. They also constituted an important food source for terrestrial animals. Because of their conducting vessels, they could be larger, a feature that phanerogamic plants inherited from them. 5. 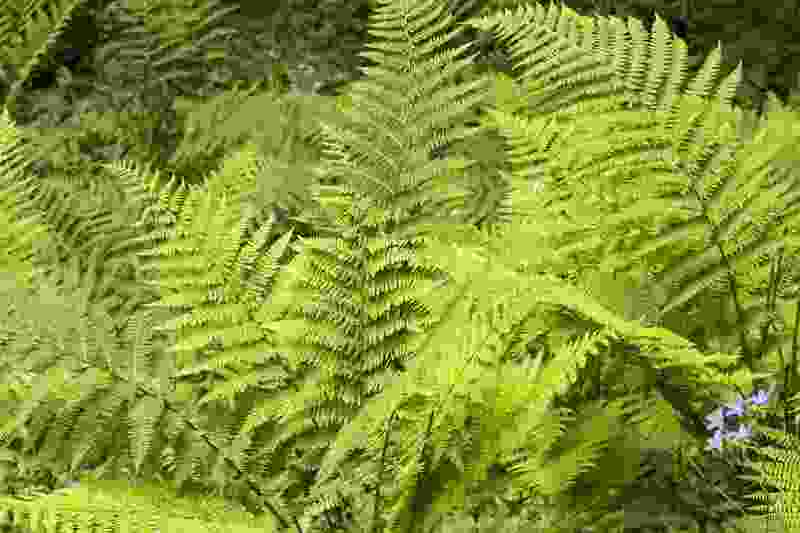 What are the main parts of ferns? Ferns are composed of small roots that shoot downwards from the rhizome (the stem, often horizontal). Fronds also arise from the rhizome. On the back side of each leaf of the plant, there are small dust-like dots called sori (singular, “sorus”, also known as “seeds”). 6. What type of life cycle is followed by pteridophytes? Like all plants, pteridophytes go through a diplobiontic (alternation of generations, or metagenesis) life cycle. 7. Why are pteridophytes more common in humid places? Pteridophytes are more common in humid places because they depend on water for their gametes to fertilize one another. In humid environments, their reproduction is more intense and they proliferate. 8. In what structure of the adult fern can cells undergoing meiosis be found? In these plants, meiosis takes place within structures called sori, small dust-like brown dots that line the underside of fern leaves. Sori contain sporangia where reproductive cells undergo meiosis and where spores are produced. 9. What is the prothallus of pteridophytes? The prothallus is the pteridophyte gametophyte (the haploid individual that forms gametes). The gametophyte develops via mitosis from a spore. 10. How are gametes formed during the pteridophyte life cycle, by mitosis or meiosis? What type of meiosis occurs in pteridophytes? In pteridophytes, gametes are produced via mitosis from special cells of the gametophyte. As with all plants, in pteridophytes, meiosis is sporic, meaning that cells of the sporophyte undergo meiosis and generate spores that then develop into the gametophyte via mitosis. 11. What is the lasting form of pteridophytes, the gametophyte or the sporophyte? How can this be compared to bryophytes? The lasting form of pteridophytes is the diploid (2n) sporophyte (the fern itself, for example). In bryophytes, the lasting form is the gametophyte (n). 12. What is a xaxim? Most pteridophytes have underground stems parallel to the substrate called rhizomes. Xaxim is a type of pteridophyte with an aerial stem that is generally perpendicular to the soil and from which hundreds of roots arise to absorb water from the environment. Xaxim stems are used to make flower pots and other plant supports for gardening (also popularly known as xaxims). Study the next subject: go to Gymnosperms.